When did you start powerlifting? Around the end of 2013. First meet was 3/2014. Why did you start powerlifting? I liked going heavy when lifting at the gym. Do you lift Raw / Geared / Both? What are some of your lifting accomplishments? Elite totals in the 148 and 165 classes. What do you enjoy most about powerlifting? Being able to lift a weight I couldn’t lift before. Who are your biggest influences in this sport? My teammates, such as CC Holcomb, Barbara Lee, Angela Bivens, Ana Perez. And my coach Steve Goggins. 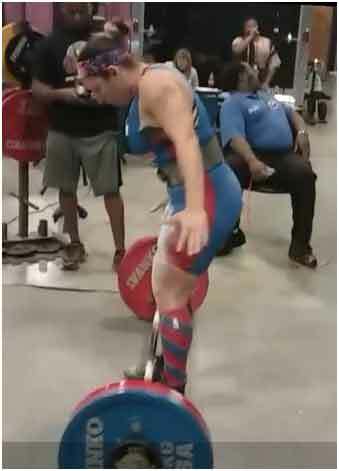 Who are some of the contributors to your success as a powerlifter? Steve Goggins for fixing my lifts and being patient with me. Myself for not quitting when it was going really bad in the past. What do you believe is the most important aspect of your training and why? Good programming, because without it I would be unable to recover. It also enables me to do best on meet day when it matters. Wanting to lift more weight and beat what I did before. Wanting to set records and get on Powerlifting Watch’s top 20 in my class. What’s the toughest thing you’ve had to overcome in order to reach your goals? A year of terrible lifting and injuries from car accidents. What is your favorite quote / song to get you motivated? “If the weight crushes me one time, I’m gonna come back and get it again. Cause it may beat me in the battle, but I’m gonna win the war.” -Chad Aichs. Has becoming a powerlifter revealed anything unexpected for you? It has shown me with persistence I can do things I previously thought I couldn’t do. What tips would you give to a beginner powerlifter? Stay focused and don’t let people or situations distract you. Don’t worry about what others are doing. What other sports do you do / have you played? None, I have no coordination lol. Beat up packages at FedEx. But sometimes they beat me up. Outside of powerlifting, what do you like to do in your spare time? Walk trails, watch Dolphins football. Idk. How did you come to train with Steve? John Greaves recommended him, after I left a team which was not right for me. What is the best part of being part of The Goggins Force?